Text from the Syracuse Evening Herald, September 1, 1886 with some added breaks and pictures. The attention of the visitors to the cemetery at Pompey Hill is naturally attracted to the monument that stands at the right of the entrance. It is an imposing shaft, placed midway of a long narrow lot and flanked on either side by a row of graves. 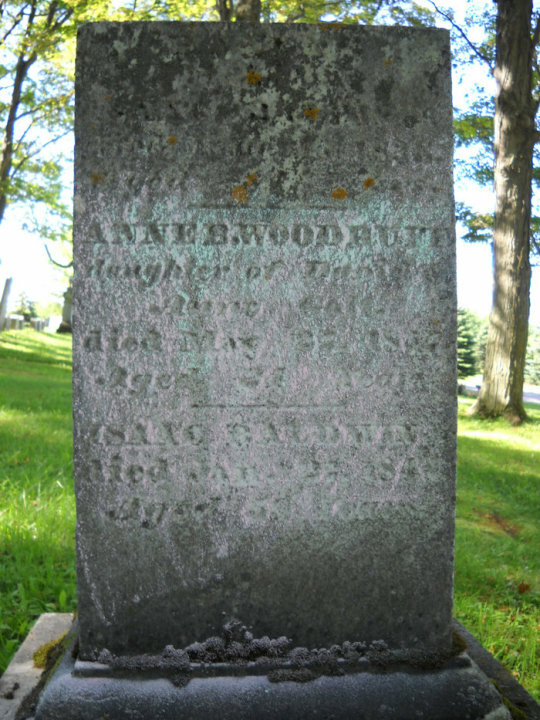 It is the burial place of Isaac Baldwin and his numerous descendants. In an obscure part of the eastern face of the obelisk is the inscription, “Isaac Baldwin, died January 27th, 1844 age 59 years.” This simple line perpetuates the memory of a madman. He was the son and bore the same Christian name as did the founder of the Baldwin family in Pompey. For thirty years before his death he was confined in a small building back of his father’s house on Pompey Hill. The little pen was known as the “Baldwin mad-house” and it now forms an insignificant wing of the Hilltop House. Strangely enough, its diminutive proportions make a striking contrast with the stately upright of that famous resort. Doubtless very few of the guests who have summered at Pompey Hill know the history of that little structure. The story of its former occupant was related on a recent visit to Pompey. “Isaac Baldwin,” said the informant, “was rarely allowed to leave the mad-house. Only when the accumulations demanded a cleansing of the interior would they let him come out. He seldom wore any clothing, as it was impossible to keep him dressed, as he tore everything in to shreds. One peculiar phase of his malady was his ability to read intelligently. A newspaper would be read through and then torn to bits. The Greek testament would be treated in a like manner after he had perused its pages. He had been liberally educated, being, I understand, a graduate of Yale college. The family seemed to have had very little affection for the unfortunate man, and there was good cause for it. He was fed regularly and given all he would eat, but it was the coarsest kind of food. In cold weather he had plenty of blankets with which to keep himself warm, but I do not think they ever kept any fire in the house, as it was not safe. Still they may have done so and had a stove in the hall, which was partitioned off in the front part of the building. “Isaac was brought here when his father came to the village, about 1814. The father, mother and all the other children were more than ordinarily bright and were prominent people during their lifetime. No manifestations of insanity were evinced by Isaac Baldwin during his boyhood nor during his college life. After graduating he selected the ministry as a profession, and was studying for the work when he met Eliza Steel, a young lady from Amenia, Dutchess county, New York. The reputation of the seminary at Litchfield had induced her father to send her to that institution to be educated. Litchfield was the home of the Baldwin family, and the young lady became acquainted with the theological student. Baldwin fell desperately in love with Miss Steel, but she did not reciprocate his passion. He declared his love and was rejected. Eventually she returned home and went to teaching in a district school. Baldwin brooded over his ill-success and finally determined to follow the girl to Amenia. Encouraged by the kindly reception which he received, he renewed his protestations of love and was again refused. His second rejection made him a lunatic. Rushing on the unsuspecting girl he plunged the blade of a small penknife in to her breast. Terrorized by his attack, she made no attempt to escape and he continued the diabolical work until the bleeding girl fell in a swoon on the floor. When assistance came to her she was unconscious. An examination of her body disclosed more than fifty wounds. She lingered some weeks, then died. Baldwin was arrested and jailed, but before the time came for the trial his father arrived from Connecticut. In an interview with his son the father became convinced that Isaac was insane. The authorities were apprised of the young man’s mental condition, and they decided to release him without trial. It was arranged that Isaac should be committed to his father’s care and by him confined in some secure place where he could do no further harm. On the journey back to Connecticut he eluded the vigilance of his father and escaped. He disappeared, and the family was unable to find him. Some months later he turned up at Cherry Valley, Otsego county. He came to the house of a young couple who had been his neighbors in Litchfield. They had not heard of the murder at Armenia [sic], and he was welcomed by his old acquaintances. The family were in the midst of a logging bee when Baldwin arrived. The wife in preparing the dinner for her husband, and his help was greatly harassed by an irritable child. “I will take the baby and quiet it,” said Baldwin. Glad of his help, the mother handed the little one to him, and he left the house. He went directly to a stump about four rods from the door. He laid the infant on top of the stump, and seizing an axe that was lying near by, he severed its head from its body. The first the mother knew of its death was on the return of the madman. As he stepped inside the door he said: “There’s your baby; it won’t bother you any more.” Her back was toward him, and when she turned he had the child’s body in one hand and its head in the other. The agonizing screams of the woman brought the man to the house in a run, but Baldwin made no effort to get away. I can’t say how he was treated, but I don’t think he was tried for the second murder. He never was a free man after that until death mercifully released him.